The terrain surrounding Icefall Lodge is vast and impressive. 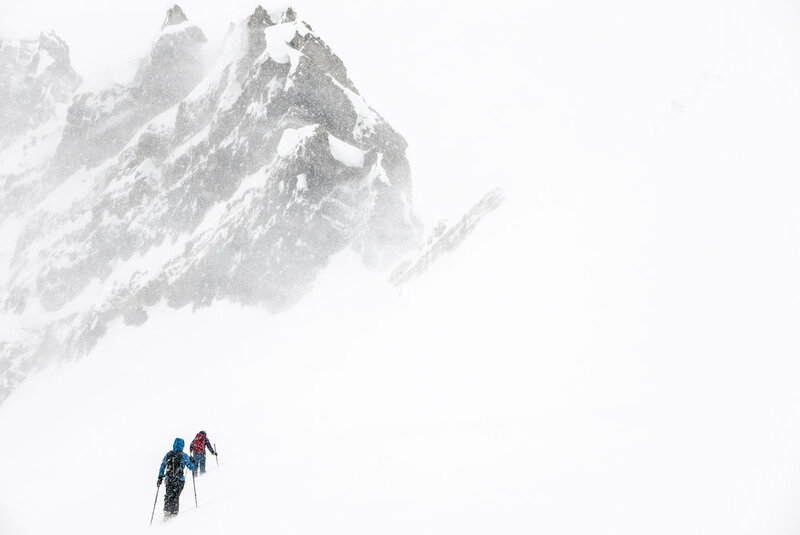 Having a guide is essential in order to truly take advantage of all the region has to offer, from alpine skiing to glacier travel and some of the longest runs in Canada. The option is yours to maximize your vertical meters, embark on a loop tour, summit several peaks and explore the area at your own pace. And, if one lodge isn’t enough, Icefall has two satellite huts situated on the Lyell and Mons Glaciers. A day’s traverse will put you in an entirely new playground full of options for fun and adventure. Or, you may choose to optimize your time spent descending by hiring a helicopter to bring you home to the lodge at the end of a long day. Anything is possible at Icefall! 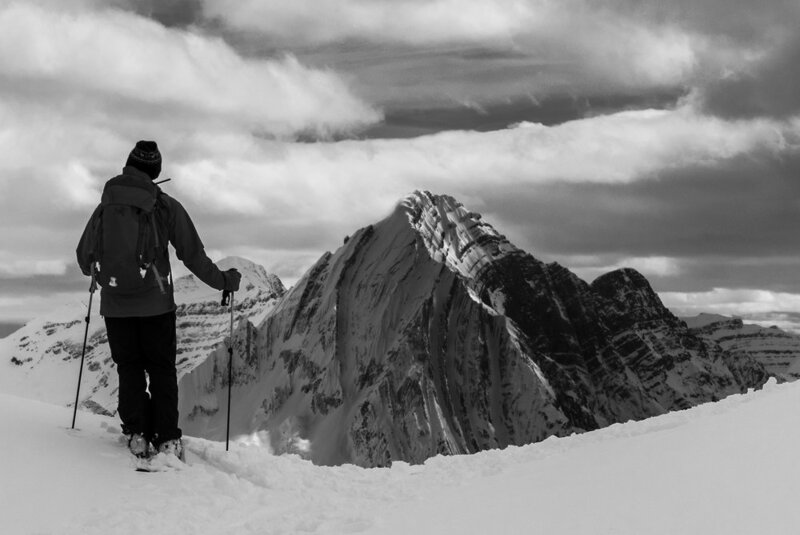 Expand your horizons and take your powder skiing adventure to a whole new level! Icefall Lodge is extraordinary – gourmet meals and all the comforts of home in a remote wilderness setting surrounded by summits and glaciers in all directions. Bask in the alpenglow from the comfort of a stunning timber framed chalet set deep in the Canadian Rockies. 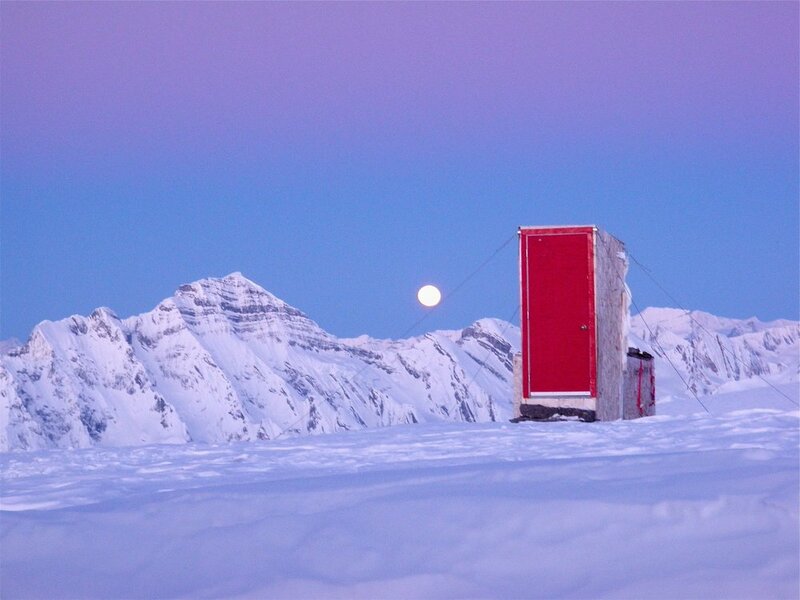 With the option to traverse to two additional huts, the possibilities are endless. Ski one area for a couple of days then move on to the next. Expand your horizons and take your powder skiing adventure to a whole new level – literally! 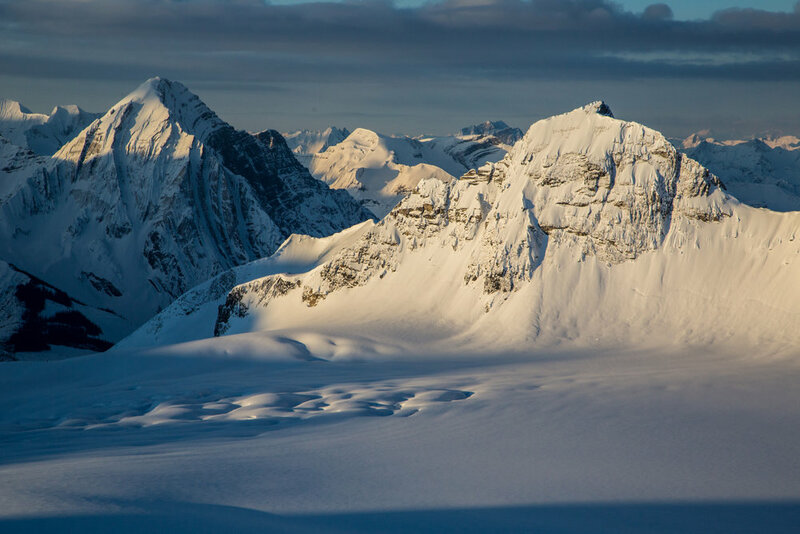 Hire a helicopter to pick you up or drop you off in remote locations, maximizing your time on skis and getting a bird’s eye view of the incredible peaks all at the same time! Unique amenities like a wood fire sauna and shower are the cherry on top of a once in a lifetime ski touring experience. Set your playlist, grab a yoga mat and stretch it out as the sun sets on another perfect day. Our trips are fully customizable to suit the needs and desires of your group. We can venture as high and as far as you like, given the weather forecast and current snow conditions. The sky is the limit! Below are descriptions of a few typical days on a guided week. There are many more options available and we welcome you to contact us prior to booking so we may customize your week to suit the needs and goals of your group. 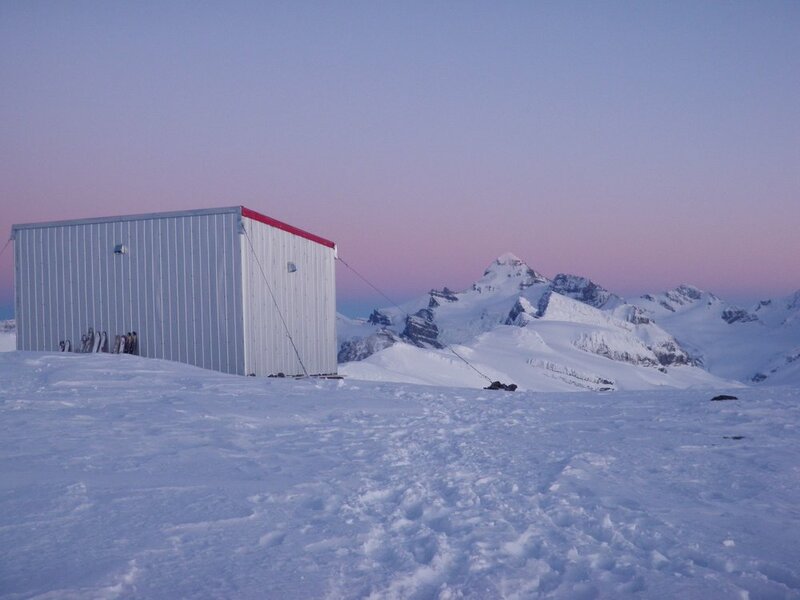 If conditions permit, your guide can take up to 10 people over to the Lyell Hut for a night. 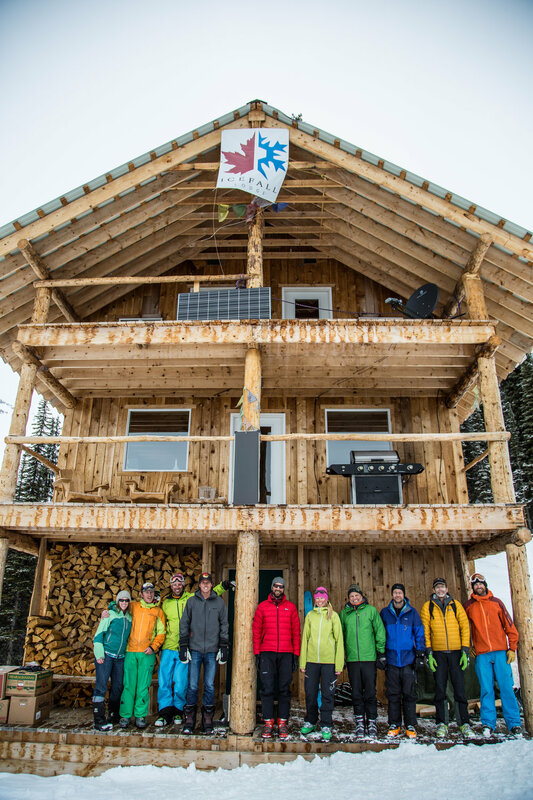 This is the highest ski touring hut in Canada and offers access to some of the highest peaks in BC. You can watch the sun set from the summit of Christian Peak, (3390 meters, 11,122 feet) and ski down to the hut in the alpenglow. This is next-level terrain with massive glaciers and long runs. Enjoy your morning coffee and evening meal beneath unforgettable sunrises and sunsets on top of the world. 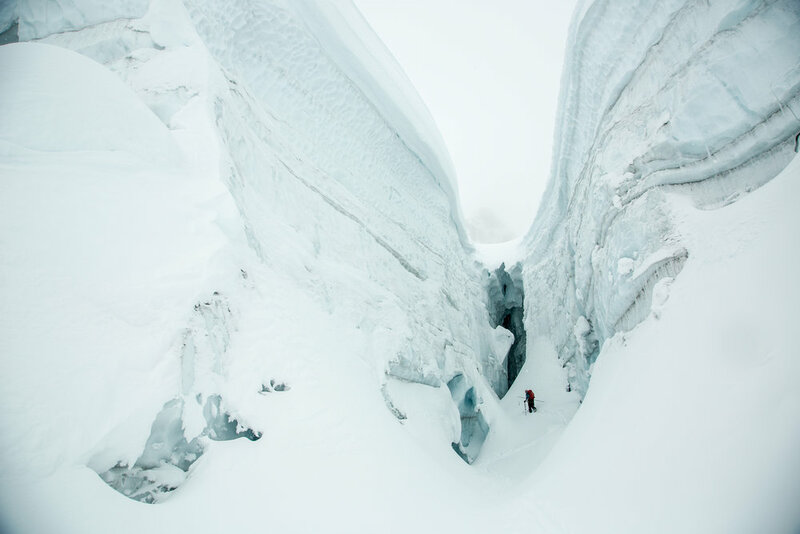 The traverse exponentially increases the amount of terrain available at Icefall Lodge. It also offers a much higher elevation and north facing glacier skiing, which is a big advantage when the weather gets warm. The traverse can be done with a light pack and normally takes 6- 7 hours. The crux of the traverse is Crampon Col: although you don’t need crampons there is a steep section that normally requires some boot packing. Returning from the hut is much faster, normally 2-3 hours. This is a classic objective that can be skied in most conditions and offers outstanding views in all directions. 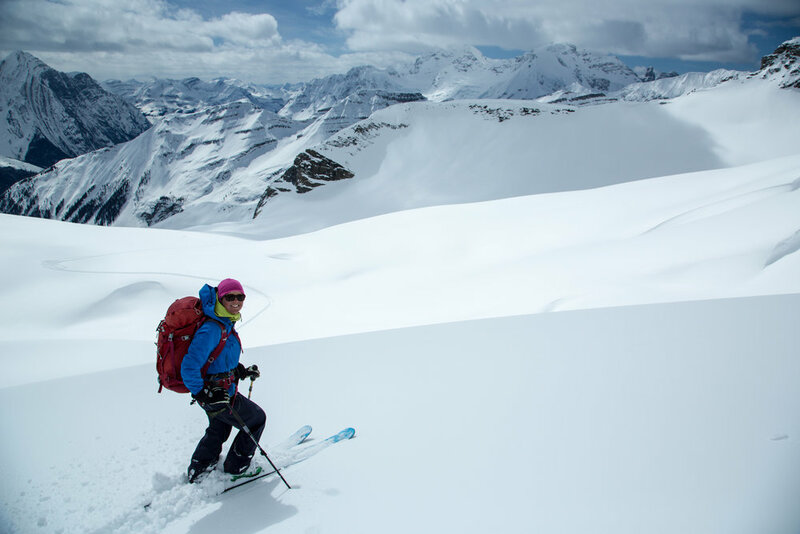 Although skis can be worn all the way to the summit, the final ridge traverse has a real ski mountaineering feel to it, which is both exciting and challenging for advanced skiers. 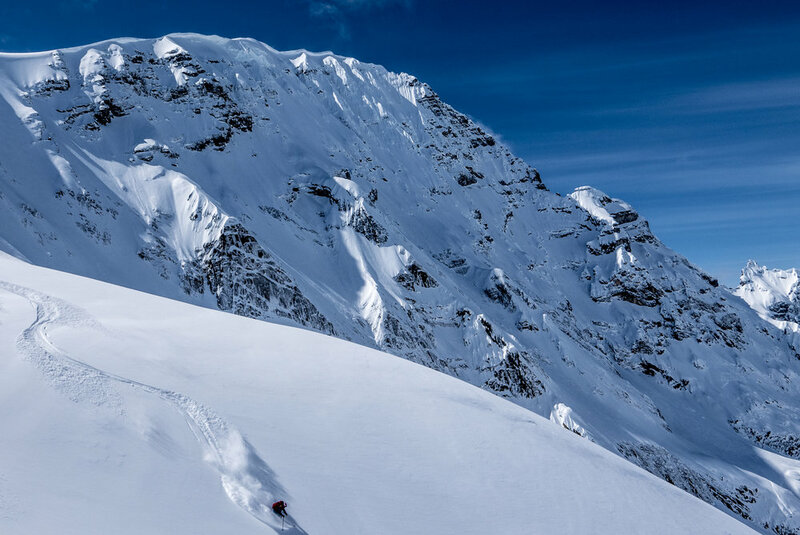 After you have finished taking in the views of the Columbia Icefield to the north, the Selkirk Mountains to the west, and Mt Forbes to the south you are treated to 1200m (4000 feet) of skiing back down to the lodge. Descent options vary from the relatively safe line that brought you to the summit, to the more committing couloirs on the east face. If you’re looking for steep and deep, this is your run! This is a long loop tour that takes you under the dramatic East Face of Rostrum Peak and all the way down to Icefall Brook. From the high point of Porcupine Saddle, it is a 1600m (5,000 ft) ski to valley bottom. 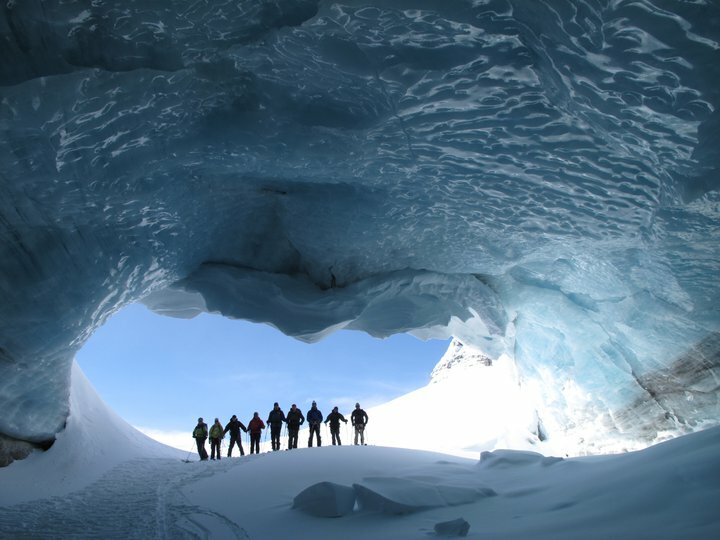 This tour takes you through some of the most impressive glacier landscape that you will see anywhere in the world. The glacier features at Porcupine Saddle change from year to year but are always unforgettable. The variety of terrain is huge with everything from tree skiing to glaciers and unforgettable rock features. This day is a whopper with almost 2200m of skiing (and skinning) from start to finish. Of course, the sun doesn’t always shine. When the snow we love happens to fall, skiing in the trees offers better visibility and delicious powder skiing. The lodge is situated in Kemmel Valley just below tree line, with open glades steps from the door in all directions. With options like this, we say let it snow! Icefall Lodge is situated at tree line with living room views of one of the most spectacular, rugged sections of the Canadian Rockies. It consists of two separate lodges and a sauna building. The new lodge is a bright and roomy three-story chalet, while the original building provides additional bedrooms and a separate living room. The location is ideal for ski touring with tree runs out the front door and a 4000-foot alpine run ending in the backyard. Relax and take the chill off in the wood fired sauna. The sauna is heated by a small stove and has a separate change room. Water is heated in the sauna and then transferred to a unique showering system to help you freshen up after a long day of living the dream. Your guide for the trip is certified through the Association of Canadian Mountain Guides (ACMG), the highest level of guiding available. The complex nature of the terrain makes the local expertise of a knowledgeable guide all the more important. 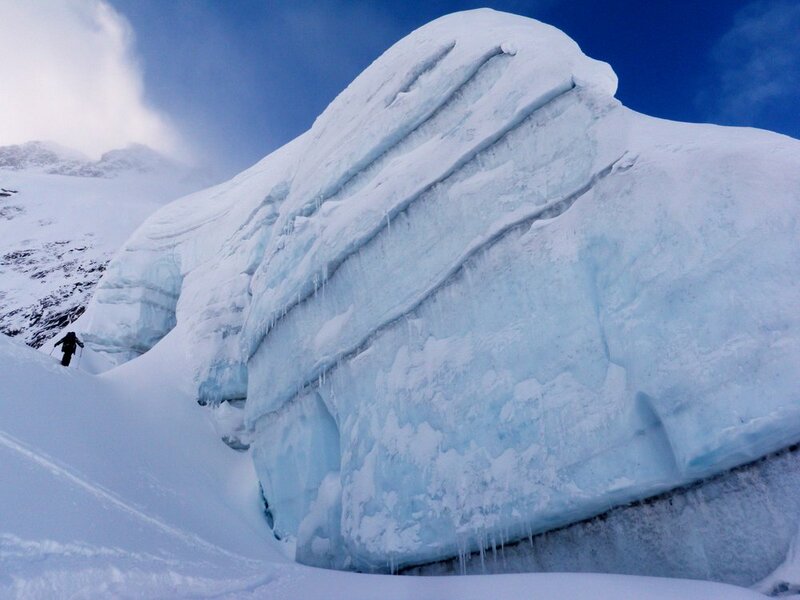 They are familiar with the complex terrain at Icefall and will get you the best skiing for your uphill effort. In addition to snowpack analysis and avalanche safety, your guide will be well trained in glacier travel and crevasse rescue. Safety is the primary concern, and a local’s knowledge of the terrain and conditions will ensure you make the most of your week at Icefall. There will normally be 2 guides and a practicum at the lodge for a full group. The group will be split up to go on different tours each day. These groups are not rigid and you can switch back and forth between groups or choose an easier or bigger day depending on how you feel. Sometimes both groups will start out in the same direction and split up at a given time and location. There is often one group that stays closer to the lodge allowing the option to return early if you want an easier or shorter day. Every effort will be made to make sure that you are with a group that matches your ability.